Yoga for Dumber than Dummies! If you remember, I tried Yoga for the first time a few Friday evenings ago and mentioned I would come back and talk about my experience. To be honest, I have simply put this off because of how ridiculously dumb I felt after my very first EASY Yoga workout. Oh, and the aches and pains I had for days afterwards…I have felt so ashamed to even share with you all! I went at this so ill-equipped. I think the most important thing one can do before a Yoga workout is to review the different postures, especially if you have never performed Yoga before. That was my first mistake! It was very difficult watching the TV at the same time as I was engaging in the exercises, which I had never before done, and I truly believe this caused my neck to ache for days afterwards. Yoga is supposed to relax you, and all I felt was extreme stress during my first workout because I had not properly prepared. Here is a great site for a simple review of basic Yoga positions as well as more advanced techniques for relaxation, prenatal and back pain: www.yogadownload.com. Secondly, water is so very important after a work out. Why? Some yoga exercises squeeze and soak your kidneys, which releases toxins in your body. You need to drink water to help flush out those toxins. I did not do this, rather I had a glass of wine! Dumber than a dummy! All my body toxins just settled back to their original locations and it felt like they multiplied because I felt so stressed trying to get the positions right! I truly could hardly move the next morning. 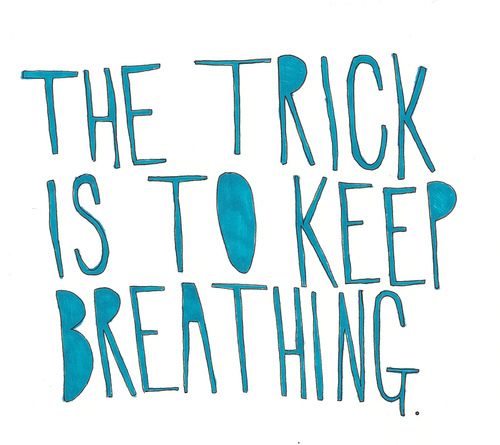 Breathing is another important part of Yoga. I found I was holding my breath through many of the exercises! You should have the ideal automatic breathing pattern. This slow and relaxed diaphragmatic breathing pattern provides the human body with superior body oxygenation: about 2-3 minutes for the DIY body-oxygen test (stress free breath holding time after usual exhalation). There are many other effects that correspond to the ideal breathing pattern. You can find them on many Web pages devoted to the ideal breathing pattern for Yoga. You should examine your motivation behind trying Yoga. Many students are happy with improved form and physique. To this end, they try impossible poses which may be beyond their capacity. They should remember that Yoga has physical, emotional, mental and spiritual benefits. Sometimes, instead of trying a difficult pose, the student may be better served performing a simple one. You may have seen perfect Yoga poses in a picture or video. Do not try to imitate the seeming perfection of the pose. It may have been morphed, for all you know. Striving towards superficial Yoga perfection can be dangerous. So, do not sacrifice your body trying the perfect pose. Rather than trying to contort yourself into a pretzel, focus on how your mind and emotions feel when you do Yoga. One of the main Yoga dangers is putting form ahead of feeling. This tendency is becoming widespread, leading to increasing Yoga injuries. Straining too hard can cause back injury, bone spurs or tendonitis. These injuries can be slow to manifest. Even some seniors, denying their age, try to perform poses which are too difficult for them. Take care not to fall into this trap. Trying too hard can cause injuries which may take many years to manifest. And, it may take some more years to rectify the damage. Therefore, do Yoga poses within your limitations to prevent injuries. I really hope my mistakes and tips about Yoga have helped you! Remember to relax, breathe and know your Yoga positions before attempting a DVD, and especially drink your water after your workout! If you are just beginning Yoga or are interested in giving it a try, taking a class with others is a fantastic idea to have hands on guidance with your session. Otherwise, if you already enjoy Yoga as part of your lifestyle, I think you would really enjoy the DVD I myself use. This entry was posted in Fitness, Stress Management and tagged Asana, breath, exercise, fitness, Friday, Hatha yoga, health, healthy living, Physical exercise, relaxation, Religion and Spirituality, United States, Yoga. I am so excited to shut off my computer today at 5:30! I am also really excited that today is Friday! Better yet, it is raining and I have a fireplace. A perfectly cozy Friday night is in store for me! Tonight I am also going to splurge and have a nice glass of chardonnay while soaking in the hot bath after Yoga. A cup of Trader Joe’s Organic Tomato & Roasted Red Pepper Soup topped with some oyster crackers for dinner, then time reading my book with pillows propped all around me in bed afterwards. Sounds like heaven, doesn’t it? I just have not decided which order I am going to do all these lovely activities! This entry was posted in Journaling and tagged bath, DVD, Friday, health, healthy soups, journaling, rain, reading, relax, Religion and Spirituality, Trader Joe's, wine, Yoga, Yoga Journal.